When I first suggested to Ethan that he help me plant seeds, he was so excited! He went on and on about seeds. Truth is, I don't think he even knew what seeds were- I'm not sure if he quite knows even now- but he sure knows what to do with them! Chances are, he was just excited by the opportunity to help. My hope was to have Ethan dump the seeds into my planters and then I would cover them with soil. I got them all ready to go and it started raining! Ugh! Downpour. He was heartbroken. So I put down some newspaper, brought one of the planters inside, and gave him a sand shovel. 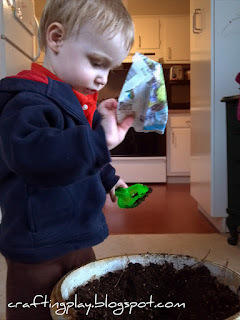 He loved dumping the seeds into the pot, and used his shovel to help me cover the seeds with topsoil. He enjoyed the activity so much that he cried when the seeds were all gone. Trying to mend his broken heart, I promised that we'd try it again outside soon. So we did. Same thing- he loved it! This time I dumped them into a cup and let him sprinkle them on the dirt. Again, he thought it was great. He was devastated when they were all gone. As a backup, I gave him some grass seed and pointed him to some bald spots in the grass. He could have planted seeds all day, luckily we ran out of daylight! The takeaway is this: Planting seeds is a super fun activity for toddlers, inside our outside! Hope you get some time to plant and that you're flowers are beautiful this summer! Do you have any good experiences planting with toddlers? The Spring Tulips we made for a gift last spring have been such a hit that I couldn't wait to post this similar project. There is minimal prep time involved, but it was a quick and easy craft to introduce using a glue stick, and the result made a great gift. Use a piece of clear tape to attach the pipe cleaner to one of the flower cutouts. Use glue stick to adhere the other flower on top- sandwiching the pipe cleaner between the two flower forms. Glue the cupcake wrapper to the center of the flower. That's it! It's quick and easy, but makes a great presentation. 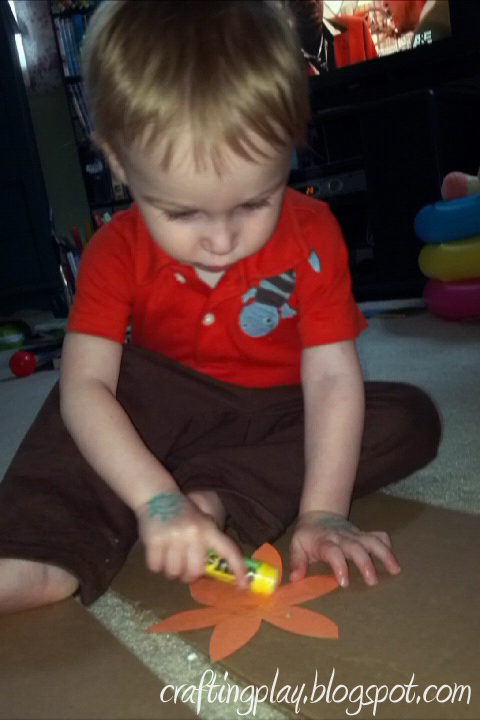 As I mentioned before, it was a great way to introduce (or practice) working with a glue stick to your toddler. Ethan really enjoyed "playing glue" and of course, he was impressed that he had a flower to proudly hand his teacher when he was all done. For the gift presentation part, I tied two of the flowers together with curling ribbon. I also added construction paper leaves that I curled a little (by wrapping them around a pencil). I also added a leaf shaped gift tag. 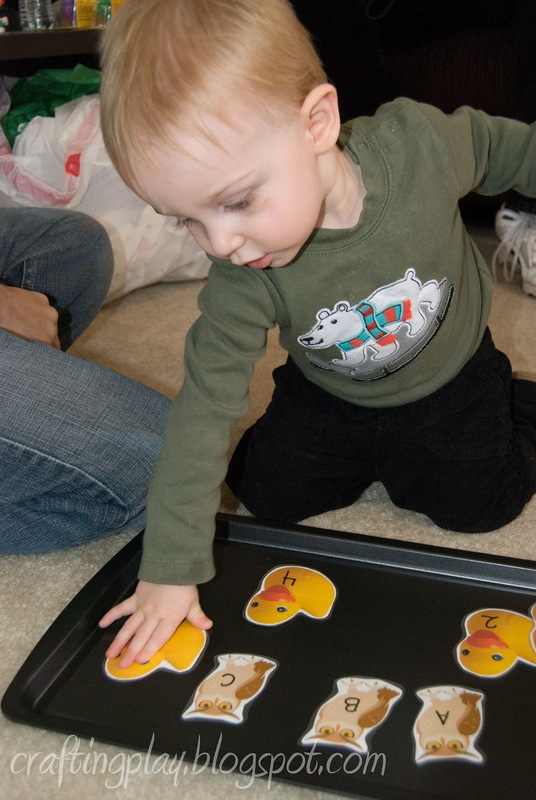 Toddlers naturally learn though exploration. This project is a great way to use the art process as a way to learn and increase fine motor skills. I went for a laid-back type project for Easter this year-- painting on cardboard cut-out eggs. What happened next was really cool. 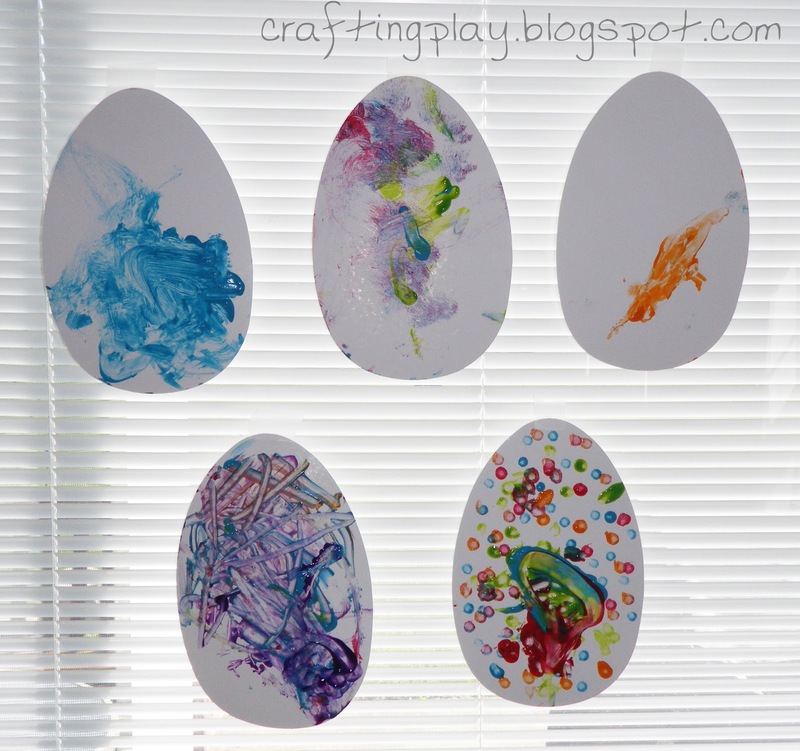 After the he had painted his third egg, I noticed Ethan was painting each egg using a different painting method. When he asked me to help him paint the fourth and fifth eggs, I took a cue from him gave him suggestions for other ways we could apply the paint. Of course, we were using our Easter eggs, but you could paint anything. 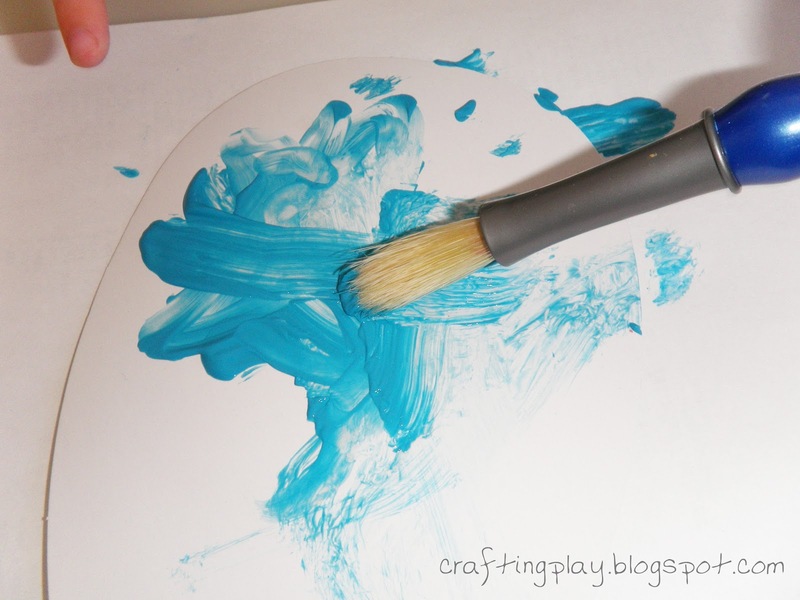 The idea is to look at alternate ways we can apply paint to the paint surface, encouraging that the toddler pay attention to the painting task in a new way. There's an unlimited number of methods that you could try. The techniques we used were very basic, but the result was that every egg looked very different. What are some of your favorite toddler paint techniques?